Academic degree – Candidate of Technical Sciences (PhD) in specialty 05.13.18 - mathematical modeling, numerical methods and a complex of programs (Institute of Mathematics MES RK, Almaty). I work at the university since 2004. Participate in the project executor in the fundamental scientific and technical projects and programs. Published over 40 scientific papers and 3 teaching aids. Since 2013 Scopus – 4, Thomson Reuters – 2, international overseas conferences – 5 (Turkey, Russia, Belarus, Hong Kong) and others. 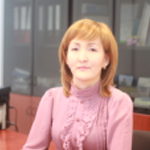 2012 – since September deputy dean for the scientific work of the Faculty of Information Technology, L.N. Gumilyov Eurasian National University, Astana. 2) Project management practice based on the PMIR PMBOKR 5th edition standard, 2016. 5) The coach of the student teams of the ENU World Championship Programming ACM ICPC 2012-2013, 2013-2014, 2015-2016, 2016-2017.